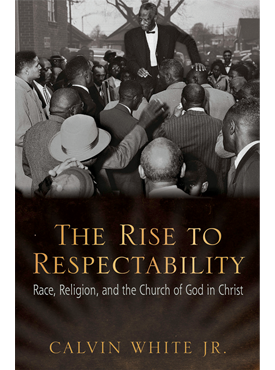 The Rise to Respectability documents the history of the Church of God in Christ (COGIC) and examines its cultural and religious impact on African Americans and on the history of the South. It explores the ways in which Charles Harrison Mason, the son of slaves and founder of COGIC, embraced a Pentecostal faith that celebrated charismatic forms of religious expression that many blacks had come to view as outdated, unsophisticated, and embarrassing. While examining the intersection of race, religion, and class, The Rise to Respectability details how the denomination dealt with the stringent standard of bourgeois behavior imposed on churchgoers as they moved from southern rural areas into the urban centers in both the South and North. Rooted in the hardships of slavery and coming of age during Jim Crow, COGIC’s story is more than a religious debate. Rather, this book sees the history of the church as interwoven with the Great Migration, the struggle for modernity, class tension, and racial animosity—all representative parts of the African American experience. The Church of God in Christ has nearly five million members in the United States. It is the largest Pentecostal church and the fifth largest Christian church in the country. Calvin White Jr. is assistant professor of history and director of the African and African American Studies Program at the University of Arkansas. He teaches African American and southern history. Course Description: This course will examine the origins, philosophies, tactics, events, personalities, and consequences of the southern civil Rights Movement. This course will begin with the struggles of black veterans to register to vote after WWII and will conclude with the Meredith March Against Fear in 1966.